Summer 2015 and 2016 - Church member and elder Pat Correll joined an evangelism mission in Mexico in 2015 and is returning in the summer of 2016 to continue work there. March 2015 - The Church members escorted youth group members on a BGCT sponsored Bounce! Mission trip to Austin, Texas. The purpose of the trip was to assist Austin residents in "bouncing back" from the October 2013 floods. The group was honored to assist families by rebuilding or repairing fences and cleaning up yards. May 2014 - Church members participated on a mission team to the Kisumu area of Kenya, Africa. The team was priveleged to teach in three local conferences for pastors, elders, other church leaders, and their wives. For some attendees, this was their third conference! A number of local pastors from the Lake Brothers Association have been working with the teams for three years and began teaching at the conferences this year. Please remember these men of God and their families in your prayers! The team was led by Pastor Dan Baugh of Lake Jackson, Texas and joined by Koos Basson of South Africa as well. 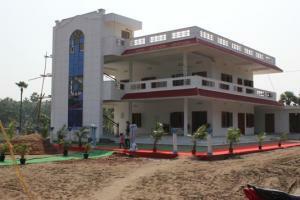 November 2013 - Church members were pleased to attend the dedication of the International School of Disciple-Making in Kesavadasu Palem, India. The school has been built by Johnson Chukka to provide local churches with teaching and resources to enable them to fulfill the Great Commission. The mission team from The Church participated in the dedication and spent several days teaching local pastors and their congregations. Church members provided an offering to purchase Bibles in Telegu, the local language, as well as desks for students at the school. The Church children provided a love offering to purchase Bibles for children in India. Church repair and building effort. 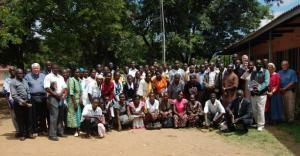 July 2013 - Church members participated on a mission team to western Kenya, Africa. The team was privileged to teach local pastors and their wives in seminars at two local churches as well as to meet and pray with officials of the new government in the region. The team also visited a local school for disabled children and provided a love offering from The Church that will assist the school in becoming self-sufficient. 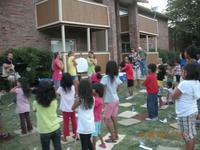 July 2011 - The Church’s 4-evening July mission trip was to an apartment complex in Fort Worth where the United Nations places refugees. Tamatha Hurst led the church's contingent. The activities, messages and music presented by our church reached more than 100 listeners, primarily refugees from Nepal. We met in a common area of an apartment complex where the people live. Approximately 200 refugees picked up on at least a smattering of what was taking place, and the gospel does have a way of taking up residence in the hearts and minds of people. There were 15 professions of faith. We returned for our 2012 Mission Trip during the evenings June 27 - 29, 2012.